1. Wash and dry the crabapples. Set aside. Prepare an ice bath in a large bowl. 2. In a heavy-bottomed saucepan, melt sugar, corn syrup, water, and a few drops of red food coloring over medium to medium-high heat. Stir until the mixture comes to a boil and then stop stirring. 3. Boil syrup until it reaches between 300 and 310 degrees F. Do not overcook! or your sugar will burn. 4. Once the syrup has reached 300-310 degrees F, remove the saucepan from stovetop and dunk briefly in the prepared ice bath to stop cooking. 5. Dip some of the crabapples in the sugar syrup and place them on silpats or pieces of parchment paper to dry. 6. Return the remaining syrup to the stove (you may want to add a little bit of sugar and water if you're running low) and add a few drops of black food coloring. 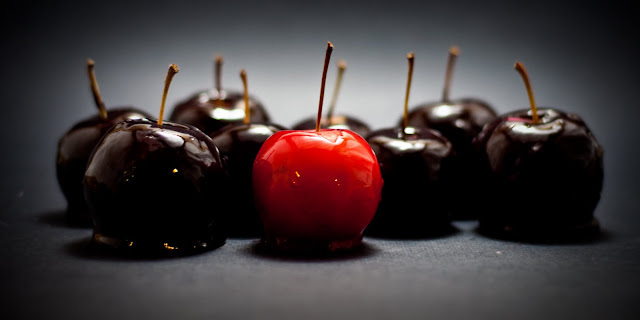 The red food coloring from the previous batch will help turn the black food coloring darker. 7. Cook syrup again until 300-310 degrees F and dunk once again briefly in ice bath. 8. Dip the remainder of the crabapples in the black syrup and let dry on silpats. If you have some leftover melted sugar, you can use it to make lollipops. 1. On a silpat or parchment paper, pour a circle of the melted sugar syrup. 2. 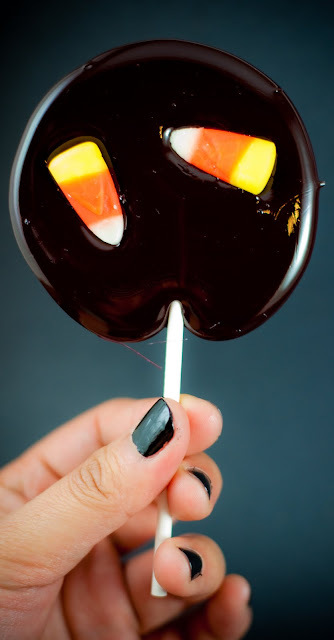 Quickly press a lollipop stick down into the center of the syrup and add desired candies (candy corn, licorice, m&m's, or nuts, if you want to be all healthy about it). 3. Pour a little bit more syrup on top of the stick to hide it from view, if desired. 4. Let the lollipops dry. 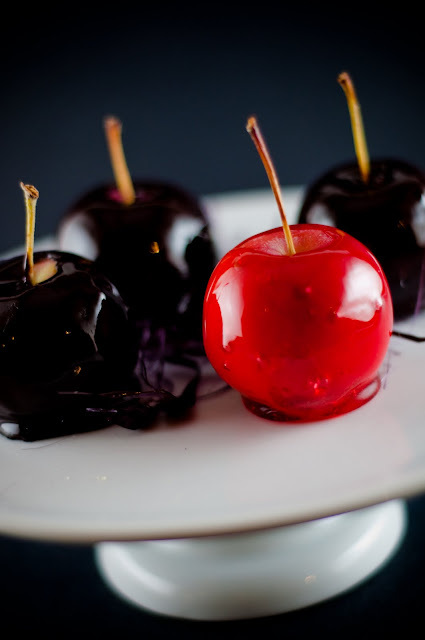 Lovely little apples and beautiful photography!!! So cute! And the black nail polish adds a spooky effect! Well done! 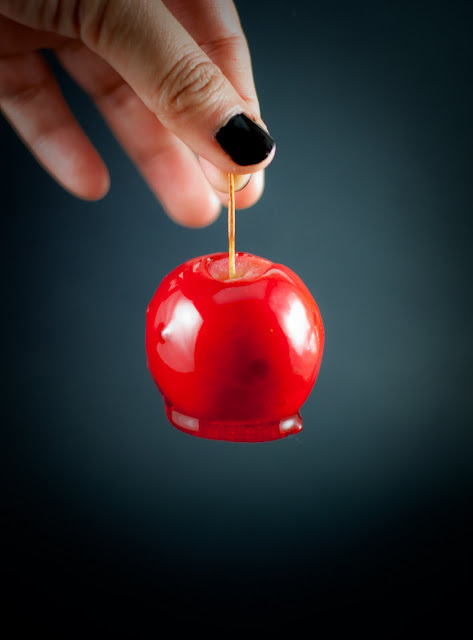 Very creative and so devilishly sinful! These look gorgeous. The red color especially and the black nail polish. The surface of them look so nice and shiny!